The Benton Harbor Fuller Center for Housing is a derivative of a Neighbor to Neighbor helping concept that was initiated in our area in 2007. The Benton Harbor area has a high proportion of substandard housing. Of those who own their home, a disproportionate rate are low income working families and fixed income seniors. We feel strongly that decent living conditions are an essential component of a healthy, vibrant community. Our goal is to match resources in the community with the housing needs. We believe that volunteerism enriches both the giver and the receiver. Our organization is just over one year old and we are still evolving. During the first year, our projects were small. 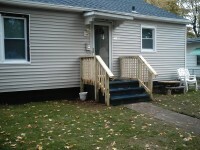 We focused on seniors and undertook projects where the homeowner provided materials and we provided labor. Our projects have targeted safety issues as well as energy concerns, due to the Michigan climate. We are endeavoring to establish a working relationship with agencies and organizations in our area with similar missions. Our most recent project was for Solomen and Lashanda Smith and their three children. We repaired the front porch, replaced windows, repaired fascia, and did electrical work throughout the house. In the future we hope to expand the scope of our activities to include larger projects, and eventually to undertake total rehabs of some of the many abandoned houses in our community. We realize that we have to crawl be for we walk, and walk before we run. We are now looking forward to a major project in Spring 09’. In terms of planning and preparation, that is just around the corner.